Holy Grail of Nirvana records and collectibles. This copy was registered on Sliver.it as one of the only Chad Channing signed promos in Existence. It is dead mint and unplayed. I only checked the wax with gloves to certify all the markings like K-Disc were visible (it is) I have one of the worlds biggest Nirvana record collections and this is currently the coveted #1. I also have number 645 dead mint and unplayed. Museum quality framed and double sided so it can be gazed upon without worry of mishandling it. The Love Buzz slash promo only turns up once every several years on EBay. If you win the auction shipping and handling is $75.00 to cover full insurance and priority/express/overnight shipping. This is the real deal, and has already been registered amongst us rare Nirvana record collectors. 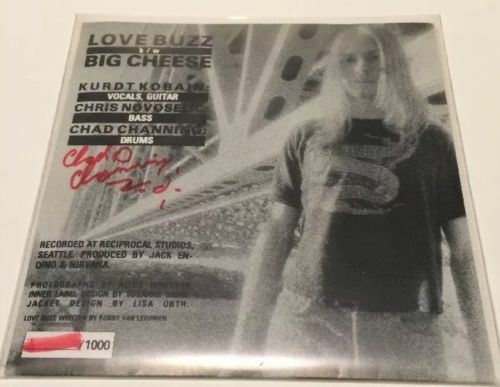 100% genuine Nirvana Love Buzz Promo signed by Chad Channing unplayed and in mint condition. Doesn't get any better! The bottom left of each sleeve's back has an area that should be numbered with a red felt pen. 1000 copies are hand-numbered. An additional 100-200 copies may be unnumbered, but will have a red "slash" where the number should be. (Images and info. )The owners' list has several examples of numbering, but it should be noted that previously published info is most likely incorrect; not all copies seem to have been numbered by a lefthanded person, let alone just one person. Copies 1-499 do not match those above #500, though the exact cutoff won't be known until more images are submitted. Two people may have numbered the first 499 sleeves, though again more images are needed to form a better opinion. Copies above #570 (since that's the earliest example we have in the 500s) are numbered by someone else, meaning two or three people are responsible for the entire 1000. The style of writing on the high-numbered sleeves is very distinctive when compared to the low-numbered official copies and some badly attempted counterfeits. As already stated, official copies have a red number, not blue or black as have been seen in the past. The vinyl is black with labels on each side. (Record Collector claims the labels have been easy to copy.) Any colored vinyl is an obvious fake. In addition to these codes, each side also has the word Kdisc machine-stamped into the groove.